A photo essay here on the Baghdad conference on Palestine, including a very unflattering picture of me! I am definitely predicting a first round victory for John Mahama, and also but with less confidence predicting he will get over 50% and there will not be a second round. John Mahama needs an overall swing of 1.5% compared to the 2008 first round to overtake Nana Addo, and needs an overall swing of approximately 2.4% to get over the 50% margin and win in one round. That is an estimate based on the poorer performance of minor parties. It looks like he will do it, but this is a projection based on a third of the results (not all of which were useful due to complex boundary changes). It is a fact that the majority of the first dozen or so results declared gave a definite swing to Nana Akuffo Addo and the NPP, across a variety of constituency types and regions, causing me and other pundits to jump to quite wrong conclusions. It cannot be ruled out that there will come a long run of swings to the NPP, but it is looking statistically unlikely now. The swing is pretty consistent and there are not obvious anomalous results. The massive swing to Mahama in Upper West is in part a reflection of the expected northern excitement at having a northern president, and was predicted. I expect we will see larger than average swings to Mahama in Upper East and Northern as well. Judging by his picture in today’s Guardian, Alan Rusbridger has invested in a new wig which plumbs new depths of unconvincingness, even by Rusbridger standards. He is moving past Donald Trump territory in the direction of Danny La Rue. The great mortification of my own life is that Nadira insists upon dyeing my hair – there are evident cultural differences over the acceptability of the practice, to the extent that Nadir’s distress at a white-haired partner even exceeds my own shame and embarassment over the dyeing. Which is an untrue description to the point of being an absolute lie. I have spent a lot more time, including insude the Ecuadorean Embassy, with Julian than Ms Airhead, and I can assure you that the most striking thing about Julian is he is very normal. Intelligent and interesting, but normal. These attempts to dehumanise him by portraying him as a weirdo are deeply sinister. It is also completely untrue that he does not meet many people in the Embassy. I am willing to bet he sees more visitors than Ms Airhead. And her speculation on who he is sleeping with is disgusting. Rusbridger – a man more disgusting than his wig. It looks like Mahama’s powerful showing in the West and the North might get him home, unless Akuffo-Addo performs very well in Accra. But not much evidence in from Accra yet. I have calculated thw swing in the first sixteen constituencies whose Presidential vote has been confirmed by the Electoral Commission. This swing is as compared to the first round in 2008, which Nana Addo narrowly won. The swing is here calculated between NPP and NDC, ignoring other parties. Aggregarting all the votes, there is a swing of 0.4% from NPP to NDC compared to the first round in 2008. But that still leaves Nana Addo in the lead, just. As usual, a Ghanaian election is way too close to call early. Today is election day in Ghana, both for President and Parliament. My phone has been hot all day with calls from around that country, and it seems strange to be following from a snowy Ramsgate. I am in the curious position of being a good personal friend of both the main Presidential candidates, Nana Akuffo Addo and John Mahama. As you can see from the photograph above, they are fairly good friends themselves. I was actually there in Kyebi when that photo was taken a year ago. John was there for the Odwiratuo festival as Vice President, Nana was present as a member of the Akyim royal family, and I was there as a guest of the Okyenhene. In yet another example of the appalling slip in BBC standards, they today report wrongly that Nana is an Ashanti! Both John and Nana are two of the nicest, best motivated and most “normal” people ever to be involved in high politics. They are both particularly kind individuals. 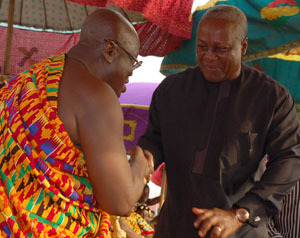 It says something about Ghana that two such pleasant men are contesting for President. By contrast, politics in western countries seems to necessitate a degree of sociopathic ruthlessness that is entirely absent from both men. I find myself thinking less about who will win, than being concerned for whichever of my friends loses. Ghana’s genuinely democratic elections have all come down right to the wire, and last time there was a tiny majority for the NDC – Nana lost by only about 20,000 votes across the entire country, after being just ahead but below 50% in the first round. Nana is not getting younger and whether he will get another chance if he does not win this time remains to be seen – though the late President Mills won the last Presidential election after two successive defeats. John Mahama’s position in the NDC is also not automatically secure should he lose, having been promoted from Vice President to President on the demise of President Mills, but having had only a few months to consolidate the affections not just of the Ghanaian people but of his own party. Whichever of my friends loses cannot therefore be certain of getting another chance in 2012, though I very much hope they will. I was absolutely appalled by the standards of the Ghanaian media in the last election. There was no debate on policy, but merely unceasing stories about the candidates’ private lives and health. Thankfully this year has been a bit better, with Nana’s promise of free senior high school education breaking new ground in introducing real policy discussion into the election. John’s commendable agreement to participate in the televised debates was also a breakthrough, and the inclusion of the “minor” candidates with full rights in those debates shamed western “democracies”. One unfortunate feature of modern western democracies has however been reflected in recent Ghanaian politics. The theoretical right/left split between the NPP and NDC appears not to reflect much in real policy difference. I expect the NDC would have done rather better had they tried harder to regain their role as the representative of the poorer sections of society. Rent control is an urgent necessity for the urban poor as property prices boom with oil development, but nobody wants to take on the World Bank over the issue. We can expect a swing to Mahama in his native north, with probably the NDC holding on to some of 2008’s gains in the West. But the Presidential election will really be decided in the huge urban constituencies of Accra and Tema, with the Ga vote likely to be decisive. Peculiarly the Ga are virtually never mentioned by political commentators. From 2000 to 2008 Ghana enjoyed a golden period of economic growth under John Kuffour, which propelled them to the front of the first rank of African economies. However pre-election fiscal looseness by the NPP in 2007-2008 coincided with the global economic crash. The NDC inherited a large deficit and debt problem. Kwabena Duffour, the Finance Minister, has done an extremely good job of keeping economic growth going while repairing the budget deficit. Kwabena is worth six of George Osborne any day. But the deficit remedy medicine did require a reining back of government infrastructure spending, and this will hurt the NDC; Ghanaian voters do like to see something tangible for their money. There was a real sense in which 2008 was a good election to lose, as the winner was constrained from doing popular things. By contrast, 2012 is a great election to win; as the booming of the economy accelerates towards double figure growth and oil revenue starts to flow through properly. Whoever wins this election will have the opportunity to undertake projects that will make a real mark in Ghanaian development, and ought to be well placed to win a second term. Ghana will be in extremely good hands in 2013-17 whatever the outcome. I cannot feel either John or Nana deserves to lose, and my thoughts will be with the loser, much as I shall congratulate the winner. Remember, politicans are people, too. If you cut them, do they not bleed? I have just opened the last of fifty boxes of 24 books which comprised the 1200 privately published hardback copies of The Catholic Orangemen of Togo. They have all sold – not more than half a dozen were given away. This has been a hard slog. Long term readers will know that I had to self-publish after multi-millionaire hired killer Tim Spicer threatened my publishers with a libel action, causing them to pull out. I then published myself and invited Spicer to sue, but he bottled out. I made the book available free online and I don’t know how many read it that way, but at least fifty thousand while we were keeping a track on the major download avenues. I suspect that increased rather than decreased sales of the hardback, but the real problem was that I found it impossible to get a self-published book accepted by bookshops, despite the commercial success of Murder in Samarkand. Anyway, the final two dozen are now available. Great Christmas presents! It is a book of which I remain very proud. I am off to Baghdad on Sunday for an Arab League conference on Palestinian detainees held in Israel. This is part of my determination to devote more of my time to helping the Palestinian cause. It seems to me we are at a crucial point where the Palestinians are in genuine danger of an accelerated genocide, as Israeli intentions to annex Est Jerusalem and the West Bank become ever plainer. In retrospect, my life has mostly been based on the idea that I may not be able to do much to help in a particular situation, but it is incumbent on me to try. So I am trying. A “two state” solution has, from the start, been advanced in bad faith by promoters such as Blair and Bush, with the intention always that it would be a Bantustan solution. For those too young to recall, the grand plan of apartheid South Africa was that the black population would be corraled into a number of small regions which would become “independent states”. I have said before that I am often pleasantly surprised by Sky News security correspondent Sam Kiley, who seems to get away with talking great sense by hiding behind a Ross Kemp style persona. A couple of days ago he reported from the West Bank that Israel was “moving towards an apartheid state”. There is no doubt that is true – even in Israel proper, there are over three hundred ethnically based Israeli laws prescribing different treatment for Jews and others, across almost every activity of the state. I fear Sam Kiley will not be on mainstream TV long – a tendency to tell the truth being career fatal. Bibi’s desire to kill off the two state solution is a terrible, genocidal threat but strangely also an opportunity. Botha and De Klerk did not succeed, and Bibi may not either. I personally would have deplored a Bantustan based solution, with crammed and split Palestinian lands deprived of resources, water, communications and any hope of economic viability. The ultimate solution must involve a proper single state in Israel/Palestine which is blind and fair in its laws to race and religion. That solution can ultimately bring security to the people of Israel, not based on their ability to kill or evict their neighbours and steal their land. The essentials of the agreement will have to be most people staying where they are – including most West Bank settlers – and very serious compensation to dispossessed Palestinians, with the settlements enlarged to become mixed communities. On the Palestinian detainee question, for me it shows up yet again Israel’s extraordinary capacity for shameless sophistry in matters of international law. Israel justifies its naval blockade on the San Remo Convention, which is only applicable in times of armed conflict. Israel states that it is in a de facto permanent armed conflict. However it denies being in an armed conflict when it comes to its treatment of Palestinain detainees, captured outside Israel, who are not treated as prisoners of war. Both positions cannot be held simultaneously, but secure in the collusion of the West’s bought politicians, Israel does so. I am with David Cameron and Rupert Murdoch in one respect on the Leveson report. British mainstream politicians are still more repulsive and self-seeking than the British mainstream media, and state regulation of the media, however modulated, is not good. But Leveson was answering the wrong question. The real problem is the ownership structure of UK mainstream media. Newspapers and broadcasters function as the propaganda tool of vast and intertwined corporate interests, shaping public opinion to the benefit of those corporate interests and ensuring popular support for politicians prepared to be complicit with those interests. The only answer to this is to break up the corporate structure of the UK mainstream media. The legislative framework to do this is not difficult. What needs to be changed are the criteria. I would propose something like this; no organisation, state or private, should be allowed effective control of more than 20% of the national or regional newspaper market or the television market, or more than 15% of those combined markets. The extraordinary thing is that Leveson specifically states that plurality issues do fall within his terms of reference, and that he must address them. He then completely fails to address them. At pages 29-30 of the executive summary of his report, he acknowledges that the current situation is unsatisfactory but makes no recommendations for change, only urging “Greater transparency on decision making on mergers”. Leveson has provided us with the distraction of an argument about a regulatory body to look primarily at invasion of privacy abuse. The important factor for Leveson is not what Cameron or Clegg think of that idea. It is what Murdoch and the media corporations think of it, and the truth is that they could live with it, after huffing and puffing, because it would have zero effect on theirfinancial bottom line. But what Leveson has totally failed to do – and doubtless never had the slightest intention of doing – was anything that hurts the corporate financial interests. Leveson’s failure seriously to address the question of media ownership and its use in the nexus of commercial and political interests is itself an appalling act of establishment collusion. Very successfully so – in all the “debate” going on about the regulatory body, the media ownership question has completely vanished. Brilliant. Many congratulations to Palestine on being recognised as a non-member state at the United Nations. There is a distinct irony that, apart from the unreconstructed climate change deniers in the United States, Canada and the Czech Republic, the supporters of Palestinian genocide could only muster votes from the tiniest island states threatened by climate change. Where is the much vaunted American Empire now? Both the United States and Israel are incapable of introspection; instead they have reacted by saying the rest of the world is mad. There was also a chilling admission of the United States support for extreme zionist land claims, from Hillary Clinton, who called for negotiation “Between Jerusalem and Ramallah”. Not Tel Aviv; Jerusalem. I argued a year ago that Palestine could join the International Criminal Court without waiting for this vote. But this vote certainly removes all doubt on that score. I was absolutely disgusted by William Hague’s offer of support form Palestine if Palestine agreed not to join, or take cases to, the International Criminal Court. It is yet another example of that theme to which my writing constantly returns, the abandonment by neo-con UK governments of the principle of international law in favour of a might is right approach. It was always UK policy to encourage dispute resolution by international courts. Now we are discouraging it. There is an extremely crucial point here: if Palestine accedes to the Statute of Rome, under Article 12 of the Statute of Rome, the International Criminal Court would have jurisdiction over Israelis committing war crimes on Palestinian soil. Other states parties – including the UK – would be obliged by law to hand over indicted Israeli war criminals to the court at the Hague. This would be a massive blow to the Israeli propaganda and lobbying machine. This explains why Hague was so keen to avert Palestinian membership of the ICC. Not only can Palestine indict Israeli war criminals (and they should start immediately with those behind Operation Cast Lead and the attack on the Mavi Marmara) but Britain will be obliged – as will all other European Union countries – to hand them over to the court. Given that this disgraceful government had specifically enacted legislation to block other avenues for the indictment of Israeli war criminals in the United Kingdom, this is infuriating for our zionist sponsored politicians. It also raises an interesting point. We have seen the entire political establishment enthusiastically promoting the automaticity of European arrest warrants in the case of Julian Assange. How will those same politicians react to the automaticity of arrest warrants for Israeli war criminals? I suspect that they will suddenly discover there is a need for political intervention in such cases. I was trying to come up with a witty and apposite acronym for BBC to describe what I have just seen on TV, but all I could manage was Beyond Belief Cunts. No attempt whatsoever to give a Palestinian a chance to put over their viewpoint. Now fifty minutes of solid coverage around the ceasefire without a single Palestinian view or pro-Palestinian or pro-peace view. And in that entire fifty minutes not one mention of Palestinian dead. Beyond Belief Cunts. Actually, it’s not a bad effort. Strangely, even the sight on television of the body of a small boy, the same age as Cameron, being dug by hand from the bomb rubble, is not what has stayed with me strongest from the latest attack on the Palestinians. Instead, I recall most vividly a radio broadcast on the BBC World Service two days before the attack on Gaza began. It was a banal, everyday story of Palestinian villagers being evicted from their land in the occupied West Bank, to make way for an Israeli “military zone”. These pastoralists had lost a thousand hectares to the Israelis in the last few years, and now these ancient villages were being finally, forcibly, evacuated in a vicious act of ethnic cleansing. The shepherds claimed that what this was really about, was the precious springs that watered their livestock. Work was already starting to divert their water to nearby, and illegal, burgeoning Israeli settlements. The BBC World Service TV has this minute, at 9.00am GMT, started its news broadcast as usual from Ashkelon in Israel, highlighting rocket attacks on Israel. There is no mention on the BBC – there has never been any mention on the BBC, or anywhere in the Western mainstream media – that for at least 4,000 years Ashkelon was an Arab town, until in 1948 the entire, Arab population of 12,000 was driven out by armed force, many being massacred. Doubtless some older inhabitants of Gaza are refugees whose home is Ashkelon. Israel is exercising its right of self-defence in precisely the same sense that Hitler was exercising the right of self-defence in Normandy in 1944 – ie not at all. Why the world puts up with this blatant ethnic cleansing and prolonged, agonizing genocide of the Palestinain people, I have no idea. It is not just about bombs and rockets and deaths now. It is about the shepherds being pushed out of their village in 2012 as part of the same process of the massacre of Ashkelon in 1948, all a process of genocide of the Palestinians in which Obama, Clinton, Cameron and Hague, as two wholw generations of western politicians before them, are actively complicit. Thanks for the many good wishes. I am now quite well, even if a lot slimmer. The problem was purely physical on this occasion, though Nadira and Cameron flying out to join me certainly helped me feel a lot better. I shall be back in the UK at the weekend. Hillary Clinton is repeating the methodology of the Iran/Contra affair, using “black” funds to finance the operation to ensure President Correa is not re-elected. I had two excellent sources for the news that the US/UK strategy against Julian Assange was to ensure the defeat of President Correa in Presidential elections next spring, and then have him expelled from the Ecuadorean Embassy. One source was within the UK civil service and one in Washington. Both had direct, personal access to the information I described. Both told me in the knowledge I would publish it. Of course Assange is not the only reason Clinton wants rid of Correa; but it adds spice and urgency. We now have completely independent evidence from Chile that this CIA operation exists, from journalists who were investigating a smuggling operation involving 300 kg per month of cocaine, organised by the Chilean army and security services. A few days ago I published information I had received that Patricio Mery Bell, the director of the news programme which broke the story, had been lured to a meeting with a young lady “informant” who had worked with CIA-backed anti-Cuban groups in Miami. She had then accused him of sexual assault (does any of that scenario sound familiar?) He was arrested and his materials had been confiscated. However I took the article down after jst a few minutes because I had received the information in emails from sources I did not know previously, and was unsure it could stand up. It does now appear that this is indeed true. My Washigton informant had told me, as I published, that the funds for the anti-Correa operation were not from the CIA budget but from secret funds controlled by the Pentagon. This could not be done by CIA funds because, perhaps surprisingly, for the CIA to operate in this way is a crime in the United States. Whether my informant knew or suspected that the “secret Pentagon funds” were drug money I do not know. They did not mention narcotics. Can somebody please show anything I have written which is anywhere near as ill-motivated? Or anything near as barking mad? Yet Phillips is mainstream and I am in some way understood to be “beyond the pale” of accepted opinion. How does this happen? Why is not everybody protected from hate speech? Unfortunately we don’t have an appropriate word as strong as “racist” to describe the kind of vile bigot Phillips is, Muslims not being a race. For Phillips to accuse Obama of conspiring with racial intolerance while promoting evil and hatred herself, is unspeakable. Actually if Phillips is acceptable as a mainstream commentator, I am proud that I am not. My friend Mike Arnott of Dundee TUC has done more than anybody to record the story of the outstanding Dundonian contribution to the early war against fascism; seventeen men from Dundee died in the International Brigade. I wonder what they would think about the alliance between the right wing Spanish “Popular Party” and the Tories plus, reportedly, New Labour to plan a demand for the expulsion of an independent Scotland from the European Union? New Labour’s commitment to keeping Trident in Scotland, to ending free prescriptions and to imposing university tuition fees makes it, I suppose, unremarkable that they would feel comfortable in this company. Four more years of drone killings, Guantanamo, crazy FBI agent provocateur plots, whistleblower prosecutions and surveillance of citizens were going to come whoever won. Goldman Sachs funded both candidates royally. I probably prefer the slightly tempered or disguised neo-con to the red meat neo-con, but let nobody pretend it makes a vast difference. A respected retired African President told me last week that George Bush did more for Africa than Obama. Amazingly, I believe that to be true; whatever his motives, a number of Bush initiatives pumped real money into useful African infrastructure. Obama’s relations with Africa have almost entirely revolved around location of military bases. Perspective changes as you move around the globe. This is a genuine offer. I will pay £100 to any person who can provide a convincing reason why Denis MacShane’s expense fiddling, involving his creating false invoices, was not a criminal offence. Your argument does not have to be unanswerable – merely respectable. Up to three prizes will be given, for the three first and not essentially the same convincing arguments. This competition specifically is open to employees of the Metropolitan Police and the Crown Prosecution Service; we would love to know their reasoning. It baffles me. I confess I can think of no single circumstance in this case that would prevent MacShane being convicted for theft and fraud. What is the answer? Denis MacShane is a criminal. If he wants to try his chances with a jury, the libel courts are open to him and I am here. The most reliable Israeli mouthpiece in the House of Commons, Dennis MacShane, has today resigned as an MP after stealing £20,000 in expenses. This was not a case of a doubtful claim – MacShane actually created, himself, 19 false invoices. Why he has not been prosecuted and jailed is a question well worth discussion. It was BICOM mouthpiece Denis MacShane who attacked Paul Flynn as “antisemitic” for querying the purpose of the long series of meetings between Matthew Gould, Adam Werritty and Liam Fox, some of which included Mossad. In doing so, MacShane did not mention his own role in setting up the first of those meetings, on 8 September 2009, and that he had been present at the start of that meeting. The FCO tried to hide that fact by deleting the entire diary entry for the meeting – but that very act prompted an old colleague to tell me.